Your Thanksgiving dinner assignment: bring a vegetarian entree. The solution? 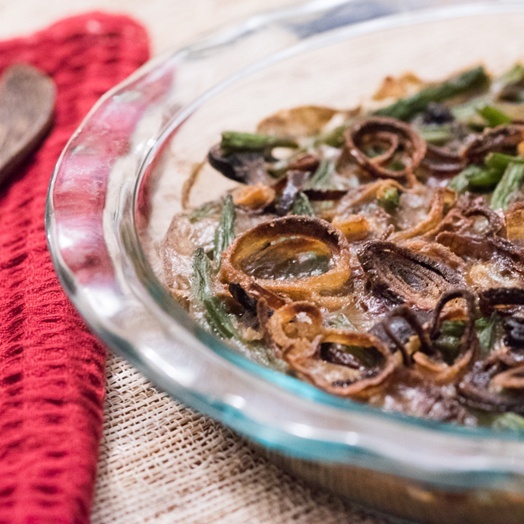 A good, old-fashioned casserole, just like mom used to make. Here are seven recipes that will satisfy even the most voracious crowd. Preheat an oven to 375°F. Butter a 9-inch baking dish. In a 4-quart saucepan over medium-high heat, pour in oil to a depth of 1 inch and heat to 350°F on a deep-frying thermometer. Line a baking sheet with paper towels. Put 1/3 cup of the flour in a small bowl and season with salt, black pepper and cayenne. Add the sliced shallots and toss to coat evenly. Working in batches, fry the shallots until golden brown and lightly crisped, 5 to 6 minutes. Transfer to the prepared baking sheet and lightly season with salt. Set aside. In a large sauté pan over medium-high heat, warm the tablespoon oil and melt the tablespoon of butter. Add the mushrooms and cook, stirring occasionally, until well browned, 6 to 8 minutes. Reduce the heat to medium, add the chopped shallots and cook, stirring occasionally, until softened, 2 to 3 minutes. Add the remaining flour and cook, stirring constantly, until fragrant, about 1 minute. While stirring constantly, slowly add the stock and then the cream. Bring to a simmer and cook, stirring occasionally, until thickened, 3 to 4 minutes. Add the green beans and season with salt and black pepper. Transfer to the prepared baking dish and sprinkle the fried shallot rings on top. Transfer to the oven and bake until the edges are bubbling and the top is browned, about 25 minutes. Let rest for 5 to 10 minutes before serving. Serves 8. 1. Make the tomato sauce. Heat the olive oil in a large, heavy skillet over medium heat and add the onion. Cook, stirring, until tender, about 5 minutes, and add the garlic. Cook, stirring, until fragrant, about a minute, and add the tomatoes, salt to taste, pepper, sugar, cinnamon, paprika and allspice. Turn the heat up to medium-high and cook until the tomatoes are bubbling. Stir together, turn the heat back to medium-low, partly cover and cook, stirring often, until the tomatoes have cooked down and the sauce is thick and fragrant, 25 to 30 minutes. Taste and adjust seasoning. Remove from the heat. If your sauce is chunky, put through a food mill or pulse in a food processor fitted with the steel blade. Set aside. 3. Heat the olive oil over medium heat in a large, heavy skillet and add the garlic. When it begins to smell fragrant, in about 30 seconds, stir in the chopped kale. Toss together and season to taste with salt and freshly ground pepper. Stir in the bulgur and dill, combine well and remove from the heat. 4. Preheat the oven to 350 degrees Fahrenheit. Oil a 3-quart baking or gratin dish. Spoon a small amount of tomato sauce on the bottom of the dish, and spoon in the bulgur and kale. Spread in an even layer. Sprinkle 2 tablespoons of the Parmesan on top and cover with the remaining tomato sauce, spread in an even layer. 5. Beat together the eggs, yogurt and 2 tablespoons of the remaining Parmesan. Season with salt, pepper and paprika. Spoon over the tomato sauce and spread in an even layer. Sprinkle the remaining Parmesan on top. Place in the oven and bake 30 to 35 minutes, until golden. Remove from the heat and let sit for 10 minutes or longer before serving. Martha Shulman, NY Times, sent to us by customer Kiley G! Preheat oven to 375. Place 1 Tbsp butter in a saute pan and saute the leeks over medium heat. Stir occasionally. Add in garlic and then mushrooms. Mix all ingredients except the Gruyere together in a bowl. Pour into a buttered casserole dish. Sprinkle cheese on top. Bake for 1 hour. Combine broth, potatoes, rutabagas, parsnips, garlic, bay leaf, and thyme in a large pot. Bring to a boil. Reduce heat, and cover partially. Simmer until vegetables are very tender, about 30 minutes. Drain. Transfer vegetables to large bowl. Add 1/2 cup butter or margarine . Use an electric mixer, beat mixture until mashed but still chunky. Season with salt and pepper. Transfer mashed vegetables to a buttered 13 x 9 x 2 inch baking dish. Salt a pot of water and start boiling the rutabaga slices. Preheat your oven to 400F/200C. While the rutabagas cook, make a sauce by melting the butter over medium-low heat in a separate pot. Whisk in the flour, continuing to whisk until smooth, then whisk in the half-and-half. Remove from the heat, add the sugar, cinnamon, salt and pepper, and eggs. Stir well. Once the rutabaga slices are soft, reserve half of them, mash the other half with the cream sauce, then mix in the remaining slices.Butter an oval or round baking dish (a deep pie plate works fine), pour the mixture into the dish, sprinkle the bread crumbs over, and bake in the middle of your oven for 30-40 minutes, or until the surface begins to brown. Heat oven to 375 degrees. Oil or butter a 2-quart baking dish or gratin dish. Refry beans: Drain off about 1/2 cup of liquid from beans, retaining it in a separate bowl to use later for moistening beans, should they dry out. Heat oil over medium-high heat in a large, heavy nonstick frying pan and add ground cumin and chili. Cook, stirring over medium heat, for about a minute, until the spices begin to sizzle and cook. Add beans and optional chipotle. Fry beans, stirring and mashing with the back of a spoon, until they thicken and form a thin crust on the bottom of the pan. Stir up crust and mix into the beans. Cook until beans are thick but not dry, about 10 minutes. Clean and dry skillet. Heat over medium heat and add olive oil. Add onion and cook, stirring, until tender, about 5 minutes. Add a pinch of salt and garlic and cook, stirring, until garlic is fragrant, about 30 seconds. Add squash, oregano, salt and pepper, and turn up heat slightly. Cook, stirring often or tossing in pan, until squash is translucent and tender, 5 to 10 minutes. Taste and adjust seasoning. Spread in an even layer over the beans. Combine corn and milk in a saucepan and bring to a simmer. Simmer 5 minutes, until corn is just tender. Stir in cornmeal and minced serrano, add salt to taste, and continue to simmer until mixture is thick, 3 to 5 minutes. Stir in grated cheese. Remove from heat and spread in an even layer over squash. Sprinkle crumbled cheese over top. Dot with butter or drizzle on oil. Place in oven and bake 25 minutes, until bubbly and crumbled cheese is lightly browned. Serve hot or warm. 1. Preheat the oven to 375° and butter a shallow 2-quart ceramic baking dish. In a medium saucepan, bring the heavy cream to a simmer. Whisk in the garlic and mustard and season with salt and pepper. Keep warm. 2. Using a mandoline, slice the turnips crosswise 1/8 inch thick. Arrange half of the turnip slices in the prepared baking dish, overlapping them slightly. Pour half of the cream mixture over the turnips and sprinkle 1/4 cup of the grated cheese on top. Repeat with the remaining turnip slices and cream. Cover tightly with foil and bake for about 1 hour and 15 minutes, until the turnips are tender. 3. Meanwhile, in a food processor, pulse the porcini until they resemble coarse crumbs. Add the panko and pulse 4 times. Transfer the crumbs to a small bowl and whisk in the remaining 1/4 cup of grated cheese. 4. Remove the casserole from the oven and uncover. Sprinkle the porcini crumbs evenly over the top and bake for about 20 minutes, until the cream is bubbling and the top is golden brown. Let stand for 15 minutes before serving.